Tall, famous landmarks around the world often contain beautiful and elegant staircases carrying tourists and sightseers up to new heights. These staircases become an integral part of history, giving visitors a way to see the structure and surrounding landscape in new ways. 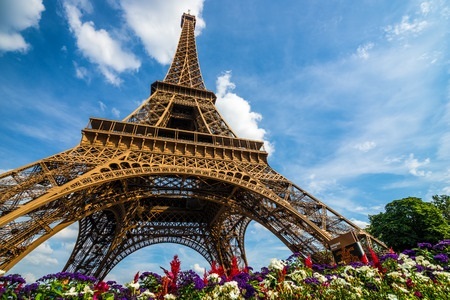 Perhaps one of the most famous European structures and the iconic image of Paris, the Eiffel Tower has been a treasured symbol of France for nearly 130 years. While you can likely picture the famous landmark as it now stands, did you know that the staggering tower once had a spiral staircase connecting its second and third levels? When French engineer, Alexandre Gustave Eiffel, finished the original tower in 1889, a gorgeous spiral staircase connected the second and third levels of the tower. Once removed and replaced with elevators in 1983, the helix staircase was divided into 24 smaller sections to be sold and auctioned off around the world. Most recently, French auction house Artcurial sold a section of the original staircase to an unidentified buyer from the Middle East for a whopping $190,885, fetching three times the amount of the initial estimated price. Other sections of the famous staircase reside in places like Disneyland, the Musée d’Orsay and the Science and Industry Museum in Paris, and near the Statue of Liberty in New York City. One of the sections sold in 2016 for $593,000, proving that no price is too high for a piece of rich history. For the 94 years the spiral stairs stayed on the Eiffel Tower, they helped make history with their design and concept. Tell your own story with a custom staircase created by Acadia Stairs, bringing you custom modern and contemporary staircase designs to increase the functionality and aesthetic of your home or business. With a custom staircase, you will make history with your own staircase in your home.